The online sector now accounts for billion of dollars of revenue globally. Make sure you’re not missing out. When deciding on a suitable e-commerce solution for your business a number of factors can encourage or discourage you from proceeding with your desired e-commerce solution. 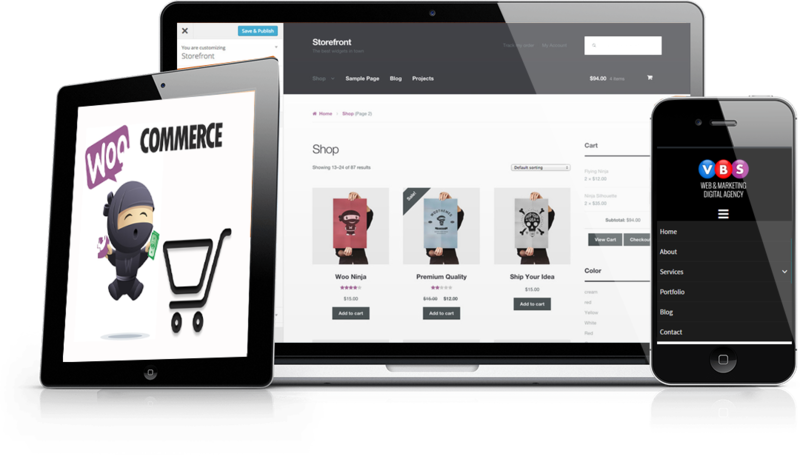 VBS offer ecommerce website packages to suit all, whether you just want to sell a small select number of products or whether you wish to create a full ecommerce solution VBS are for you. VBS can offer you e-commerce solutions, online catalogues and secure ordering – let your business operate in a worldwide economy. VBS use Woocommerce, a renowned e-commerce plugin for wordpress providing an array of functionality and user friendly browsing. We have a proven track record of supplying effective e-commerce solutions for businesses of all types and can customise your e-commerce solution to meet your web site requirements, from voucher systems and online booking to personalised products and retail solutions. LET US PROVIDE YOU WITH E-COMMERCE SOLUTIONS.